Candidate from the U.S. Republican Party Donald Trump won the presidential elections. 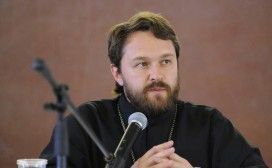 Head of the Synodal Department for External Church Relations Metropolitan Hilarion tells in his interview with Interfax-Religion how to treat such choice of the American people and what the Moscow Patriarchate expects from the 45th president of the United States. - Your Eminence, how do you evaluate Donald Trump's victory at the presidential elections in the USA? - The presidential elections is a domestic affair of the USA. We are only side observers here. However, I watched the developments with the great interest, especially last hours before announcing the results. CNN had a live translation and the tone of commentaries was changing when new and new states gave their preference to Trump. On the eve, the polls of public opinion showed that Clinton was in advance. But how objective were these polls? When the elections started, the favorite was defined from the very beginning. It puzzled CNN commentators, I would even say, it shocked them. They tried to find an explanation, and each of them did it as he or she could. One of them accused FBI director, another one said that Russia is guilty in it. He said approximately the following: "it is the first vote in history of the USA in which the hostile country directly interferes." And he mentioned Russia. American people had a possibility to watch the candidates, to listen to their speeches, to evaluate their attitude to domestic and international problems. And people eventually made their choice. The rhetoric of U.S. Democratic Party candidate Hillary Clinton had failed to convince a majority of the voters and even active support from incumbent President Obama did not give her more votes. - What do you think was the key issue for American voters? - The choice was not only between two persons. Essentially, the Americans were asked the following question: do you want everything to stay as it was or do you want changes? And the American people voted for change. - What was important in these elections personally for you? - As the head of the Synodal Department for External Church Relations was especially interested in the Middle East issue in connection with this election. would not be so successful in Syria and Iraq if they did not get international support. Trump spoke about all these things directly and clearly. He criticized the American government for his Middle Eastern policy, for giving up alliance relations with Russia. And the people of America heard him. - How Russians should treat the result of elections in the USA? - I don't think we should fall into euphoria about the Republican candidate's victory. Time will show what kind of president he will be, whether he will fulfill the promises that he gave during the election campaign. But his election gives hope for improvement of the entire system of international relations, for the creation of a unified global coalition against terrorism.